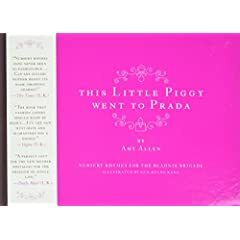 So I recently got ahold of a copy of this book, This Little Piggy went to Prada: Nursery Rhymes for the Blahnik Brigade. So funny. For those of you who have read Bergdof Blondes, this is like the kids version. Each rhyme has it’s own modern twist to it relating to fashion, shopping and couture culture. What a great baby shower gift for that friend who loves to shop, or just a fun purchase for yourself for the amusement! List price is $19.95, you can get it on Amazon for $13.57 and it’s eligible for free shipping when you spend $25 or more. And hurry… Earlier it was showing as limited quantities as it just came out, but it’s back in stock so get it while you can.